President Recep Tayyip Erdoğan arrived in Brussels on Wednesday for the NATO leaders' summit in the Belgian capital. At the NATO headquarters, Erdoğan was greeted by the alliance's Secretary-General Jens Stoltenberg, who is hosting the summit. 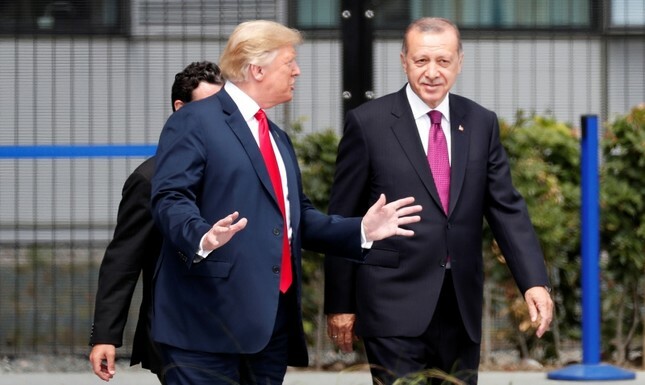 During public portions of the meeting's opening, Erdoğan was seen involved in a lengthy, heated discussion with his U.S. counterpart Donald Trump. Afterward the Turkish president also chatted with Greek Prime Minister Alexis Tsipras and Hungarian Prime Minsiter Viktor Orban. Erdoğan also held a meeting with German Chancellor Angela Merkel on the sidelines of the summit. NATO is expected to summit by signing off on several measures prepared in advance, including a high-readiness initiative that would enable NATO to mobilize 30 land battalions, 30 air squadrons and 30 combat vessels within 30 days in a bid to show unity within the alliance. The measures are the latest step in recent years to ramp up NATO's defense capabilities in response to perceived aggression from Russia, following the country's invasion of Ukraine's Crimean peninsula in 2014 and its support for separatists in eastern Ukraine.